Jamyang Khyentse Wangpo passes into parinirvana. Born in Rekhe Ajam, Sa-ngan County, in Nyarong, near Kathok Monastery. Son of the Nyingma master Rigdzin Gyurme Tsewang Gyatso and Tsultrim Tso. 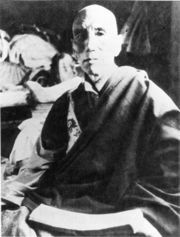 Recognized as the incarnation of Jamyang Khyentse Wangpo's enlightened activity by Jamgön Kongtrul Lodrö Tayé. Katok Situ Chökyi Gyatso, the nephew of Jamyang Khyentse Wangpo, brings him to Kathok Monastery. Enthroned at Katok Monastery. 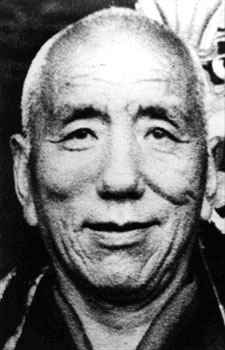 He is known as Tulku Lodrö and Jamyang Lodrö Gyatso. Caring for his ailing tutor Khenpo Thubten Rigdzin, also the former tutor of Kathok Situ Rinpoche. Towards the end of the year: death of his tutor. Gathering funds for the Katok Monastery in Horkhok and Dzachukha. Meets the King of Ling; gives an elaborate commentary on the Gang Gi Lodrö. Meets Adzom Drukpa at Adzom Gar near Tromuk. Adzom Drukpa recognizes him as the true incarnation of Khyentse Wangpo. 17th day of the second month: death of Jamyang Chökyi Wangpo—the body incarnation of Jamyang Khyentse Wangpo and throne holder of Dzongsar—during a visit to Dzogchen Monastery. Dzongsar Monastery requests Jamyang Khyentse Chökyi Lodrö to fill the vacant seat of Khyentse Wangpo at Dzongsar Tashi Lhatsé. 25th day of the 1st month: birth of Jamyang Chökyi Wangchuk, later recognized as the incarnation of Jamyang Chökyi Wangpo. 3rd day of the 3rd month: birth of Dilgo Khyentse Rinpoche, later recognized as the mind incarnation of Jamyang Khyentse Wangpo. receives the Rinchen Terdzö and Chokling Tersar empowerments from his father. receives the Druptap Küntü and other transmissions from Khenpo Samten Lodrö. passing away of his father. receives many transmissions from Thartsé Shabdrung Champa Kunzang Tenpé Nyima. 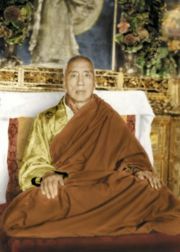 Establishes Kham-jé Shedra at Dzongsar Monastery with Khenpo Shenga as the first head khenpo. receives ordination at Dzogchen Monastery. receives transmissions of Changter, Minling ter and many other teachings from Shechen Gyaltsap Gyurme Pema Namgyal. Stays several months at Dodrupchen Jikmé Tenpé Nyima's hermitage in Golok and receives the empowerments of Rigdzin Düpa and Tiklé Gyachen, as well as the teachings on Longchen Nyingtik (including Yeshe Lama) and Guhyagarbha Tantra. receives the transmissions of Damchö Dechen Lamchok from Könmé Khenpo of Dodrupchen Monastery. Visits Tertön Sogyal in Golok; receives teachings and the transmissions of Vajrakilaya and Tröltik. First pilgrimage to Central Tibet, visiting Sakya Ngor, Lhasa and Mindroling. Kathok Situ Chökyi Gyatso passes into parinirvana. 10th month: visits Neten Monastery. visits Shechen Monastery and receives many transmissions, inlcuding the Damngak Dzö and Changter from Shechen Gyaltsap Gyurme Pema Namgyal. Gives the reading transmission of the Nyingma Gyübum and of the Treasury of Precious Termas to Dilgo Khyentse Rinpoche in Dzongsar. 21st day of the first month: performs a drupchen for Jamyang Khyentse Wangpo's anniversary, and later proceeds with the transmissions of the Treasury of Precious Termas. Gives the empowerments and transmissions of the Treasury of Precious Termas to about a hundred students in Dzongsar. Dilgo Khyentse Rinpoche, Shechen Rabjam, Katok Situ, Pewar Rinpoche, and other important tulkus were present. Gives the Treasury of Precious Instructions in Dzongsar. Dilgo Khyentse Rinpoche, Shechen Gyaltsap's reincarnation and Pewar Rinpoche were present. Sogyal Rinpoche goes to live with JKCL at Dzongsar, where he treats him as his own son. JKCL recognizes him as the incarnation of Tertön Sogyal. Spring of 1954: gives the Compendium of Sadhanas to more than 70 students in the empowerment room of Jamyang Khyentse Wangpo, The Garden of Immortality. In the assembly hall of Dzongsar he gave the Collection of a Hundred Sadhanas (Wyl. sgrub thabs brgya rtsa) to more than 400 people. In the summer of the same year, the Sakya Dagchen of the Phuntsok Podrang comes to Dzongsar to receive Lamdré and Compendium of Sadhanas from Jamyang Khyentse Chökyi Lodrö. He also gives a major Hevajra empowerment and many other special Sakya teachings. Dilgo Khyentse Rinpoche and Pewar Rinpoche are present. Jamyang Khyentse Chökyi Lodrö at Samdrup Podrang in Lhasa, 1955. 4th month: composes Nyingtik Saldrön guru yoga at the request of Dilgo Khyentse Rinpoche and Princess Yudrön. Meets with Tulku Urgyen Rinpoche, who facilitates his visit to Tsurphu. 12th month: stays in Tsurphu (arrival on the 23rd) and meets with the Sixteenth Karmapa, the Dzogchen Pönlop, Jikdral Tsewang Dorje, and Tsurphu Khandro. Receives the transmissions for the sections of the New Treasures composed by the Fifteenth Karmapa, Khakhyap Dorje, which he had not yet received, and an empowerment of the red form of Avalokiteshvara known as Ocean of Conquerors and the rigpé tsal wang connected with it. Celebrates Losar at Tsurphu. Stays until the 8th of the first Tibetan month. Sikkim (arrives at night in Gangtok from North Sikkim, according to Semo-la). Celebrates Losar with H.H. Sakya Trizin's party on their way back from India to Sakya. In the Month of Miracles, in the Palace Monastery in Gangtok, gives empowerments of Lama Yangtik, Rigdzin Düpa, Palchen Düpa and Yumka Dechen Gyalmo, and teaches on the Longchen Nyingtik Ngöndro. July and August 1958: Dhongthog Rinpoche visits JKCL in Darjeeling. From the 19th to the 23rd of the 6th Tibetan month, he received teachings on the mantrayana vows chapter of the Dom Sum Rabyé, and on the 25th he received a lung for the pratimoksha chapter, and for the Chanting the Names of Manjushri. He requested a heart advice, and JKCL composed The Beautiful Precious Garland: Words of Advice for Self and Others. Jamyang Khyentse Chökyi Lodrö in Gangtok, circa 1959. Parinirvana on 6th day of the 5th month, the 12th June 1959.
cremation at Tashi Jong, Sikkim. Ceremonies are led by Dilgo Khyentse Rinpoche. ↑ According to Tibetan custom, during the first months of a person's life, that person is considered to be one year old, until the next Tibetan New Year (Losar), when they turn two. This timeline reflects this Tibetan custom. ↑ See Tulku Thondup, Masters of Meditation and Miracles, p. 245. ↑ There is still some uncertainty concerning the year of this first pilgrimage. ↑ Further reading: Dilgo Khyentse, Brilliant Moon, pages 108-120 & 277-278. ↑ According to Pewar Rinpoche. Further reading: Brilliant Moon, page 278. ↑ According to Tulku Urgyen Rinpoche. ↑ According to both Phugpa and Tsurphu Tibetan calendars. Information from www.kalachakra.org . This page was last edited on 5 January 2018, at 16:33.